East Greenwich is an idyllic historic New England town that is located in the center of Rhode Island. Located on the west shore of the Narragansett Bay it is home to a picturesque harbor district that includes a wide variety of shopping and dining opportunities; East Greenwich is the perfect place to live, work and play. The professionals at Big Blue Bug Solutions understand the unique pest control needs of people living in Rhode Island and throughout New England. Our Big Blue Bug, “Nibbles”, that sits atop of our Providence office is not just an awesome mascot, but a reminder to the people of Rhode Island that we are committed to providing superior customer service and top-notch pest control services. Find out now how we can help to keep your quaint New England property free of the many pests that also call East Greenwich home! Protecting your home from invaders is every homeowners top priority, you put into place security measures to keep human invaders out, but how do keep other types of dangerous invaders, like insects and rodents out of your home? The answer is simple, by putting into place a year-round pest control program. At Big Blue Bug Solutions we offer effective pest control solutions to protect your home from pests like ants, Indian meal moths, millipedes, cockroaches, earwigs, flies, and many more. Our Home Owner’s Policy (HOP) offers year-round protection against common home pests through 3 services visits per year (spring, summer, and fall). During our visits our professionals will treat for pests and provide on-going monitoring for vulnerable areas. For even more peace of mind that your home is completely protected from pests, remember- that if pests problems arise between visits we will come back at no charge to you! At Big Blue Bug Solutions, we know how vital pest control is to your East Greenwich commercial property. Just one tiny ant or one tiny rodent dropping can be detrimental to your business’s reputation. Whether you are a restaurant owner, hotel owner, retail business owner, or own any other kind of commercial property in East Greenwich we can help! Our specially trained technicians have a deep understanding of how to eliminate and control pests in the most environmentally sound way possible, through Integrated Pest Management (IPM) techniques. IPM allows our professionals to resolve pest problems using the least amount of pest control materials possible, while still effectively eliminating and preventing pest problems. Give us a call today, to find out how we can protect your East Greenwich business from pests through our customizable commercial pest control services. Big Blue Bug Solutions doesn’t just protect East Greenwich homes from bugs, we protect homes and other properties from larger, wilder pests like squirrels, raccoons, skunks, and more! If squirrels have made their way into your attic space and are wreaking havoc in your home, our professionals can get rid of them through our wildlife control services. Whether it is a small squirrel or large raccoon only a professional should handle and remove them from your property, it is very important to remember that when any wild animal feels threatened or scared they become dangerous. Contact Big Blue Bug Solutions today to schedule your free wildlife inspection! With over 80 years in the pest control industry, you can count on the professionals at Big Blue Bug Solutions to be able to solve any of your home’s or business’s pest control needs. We offer a wide range of pest control services in addition to home pest control, commercial pest control, and wildlife control; those services include bed bug control, carpenter ant control, pest control insulation, and termite control. All of our technicians are continuously trained and are dedicated to providing pest control services that are effective, safe, humane, and environmentally friendly! For more information about how we can control pests in your East Greenwich home or business, contact us today. 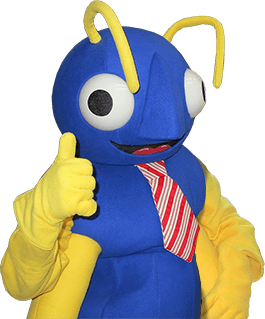 With Big Blue Bug Solutions professional’s and “Nibbles” on your side, having to worry about bugs and other pests will soon be a thing of the past! I would personally like to request that your technician, Brian Goldman, continue as the Pest Control technician at Heritage Village Apartments. Brian conducted himself professionally and, while explaining the procedure for spraying my buildings, spoke to my Assistant Manager in a respectful and knowledgeable manner. Thank you for your assistance in granting this request."